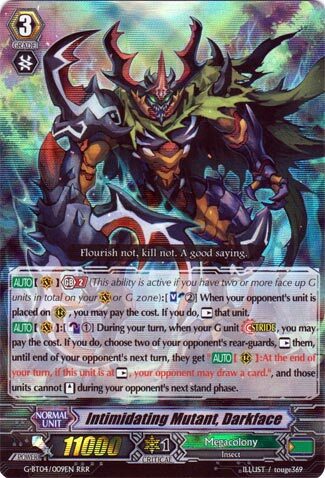 [AUTO](VC) Generation Break 2 (Active if you have two or more face up G units in total on your (VC) or G zone):[Soul Blast (2)] When your opponent’s unit is placed on (RC), you may pay the cost. If you do, [Rest] that unit. [AUTO](VC):[Counter Blast (1)] During your turn, when your G unit Stride, you may pay the cost. If you do, choose two of your opponent’s rear-guards, [Rest] them, until end of your opponent’s next turn, they get “[AUTO](RC):At the end of your turn, if this unit is at [Rest], your opponent may draw a card.”, and those units cannot [Stand] during your opponent’s next stand phase. Ah, how time has flown. How this card has aged. I must admit, now that we have two Darkfaces with two completely different playstyles, inevitably I’m going to have to ask myself which one I prefer. Between this and Gredora…Gredora wins. She has more sustainability but more importantly, a more assured way to actually CONTROL a field. This thing just paralyzes, but paralyzed units can just sack themselves off if they have the skill for it, or the opponent can call over. It shuts down only those lacking hand sustainability and merely annoys all other decks. And the meta is going to be big on hand so I wouldn’t really put much stock in it.